This special issue touches on many significant aspects of multimedia retrieval, including content analysis and understanding, content- and context-based indexing, search and retrieval, HCI technologies, and image and video summarization and visualization. 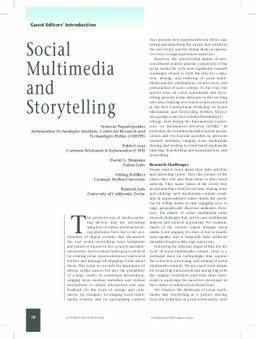 It converges on the nexus of social multimedia and storytelling around real-world experiences, events, and places. Aside from the challenging research problems in this emerging area, its topics are linked to a host of important commercial and creative applications in sectors such as media, entertainment, arts and culture, sports, and music.